What would I do without my mama? She’s a friend and trusted advisor no matter how many miles away we are from each other. It’s so fun to reach a new phase in life where she’s not just “mom.” She empowers me to take on my girl boss goals, sends me stress- releasing coloring books after tough days, and is helping me plan my DIY wedding to my future husband! I’m so thankful to have her in my life and hope she knows how much I care and appreciate her (I know you’re reading this mom, because you’re awesome and supportive of my blog!). 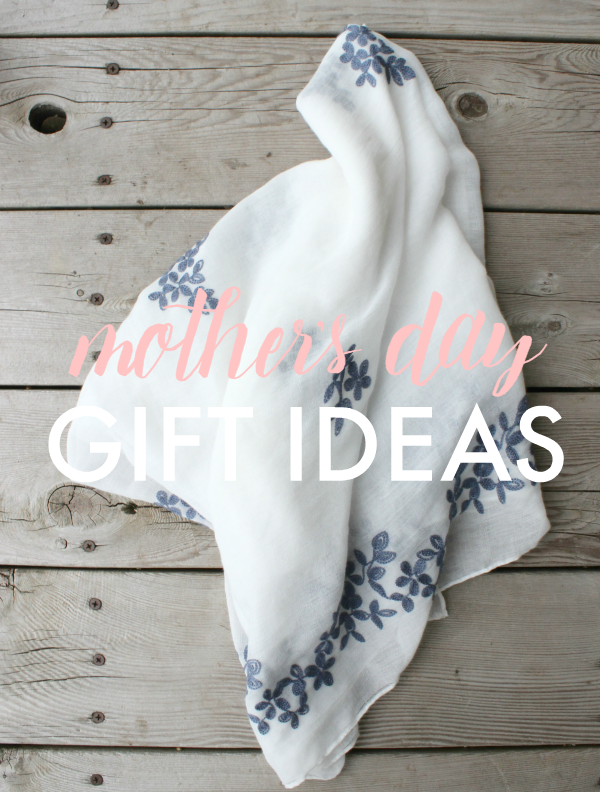 I’ve partnered with francesca’s to share a gift guide filled with my favorite picks for mom (I even have a special gift I chose just for her). I’m also sharing my spring Mother’s Day weekend style. It’s totally getting packed in my suitcase for our upcoming mother/daughter weekend getaway to San Francisco and wine tasting in Sonoma! 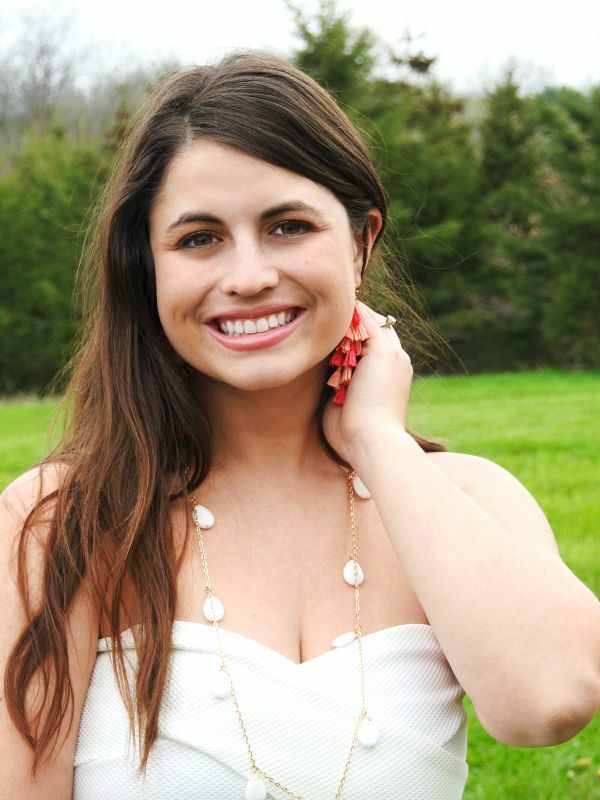 First, the quintessential little white dress paired with playful, statement-making accessories. 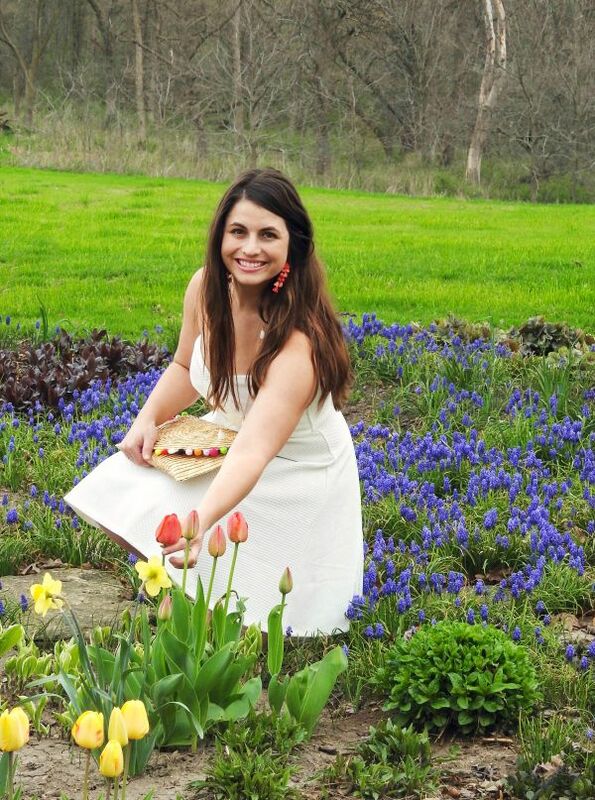 Maybe it’s because I’m getting married and have engagement parties, bridal showers, and wedding festivities galore, but, I can’t get enough of little white dresses right now. It’s the perfect blank palette and offers versatility to switch things up by styling with different accessories. 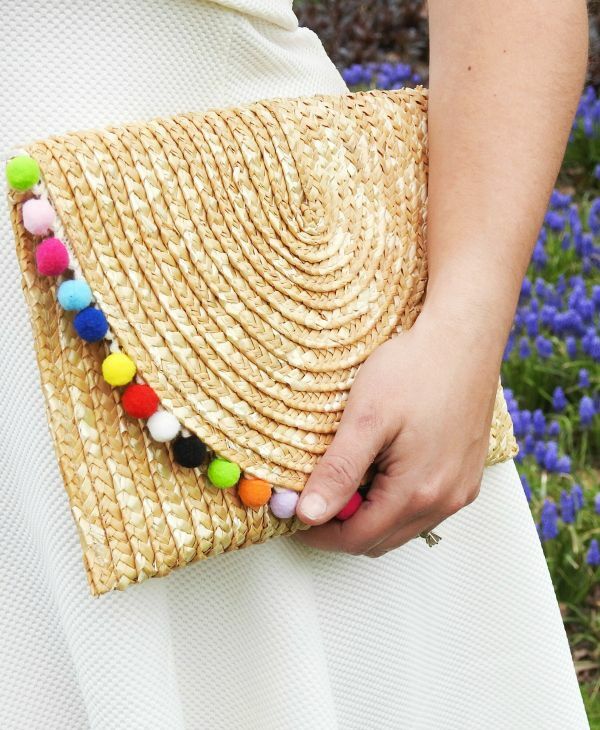 I’m really loving the summery vibe of these trendy tassels and pom poms accessories, but this white dress could be equally as chic with a pair of preppy pearls and Jack Rogers sandals. I shot these photos outside at Kyle’s family farm. I love seeing all of the flowers start to come to life. Seeing everything in full bloom is sort of like my unofficial signal to break out the twirly dresses and open toe sandals! Mother’s Day is Sunday, May 8th, so there’s still time to get your mama something special! I’ve rounded up a few of my favorite ideas. 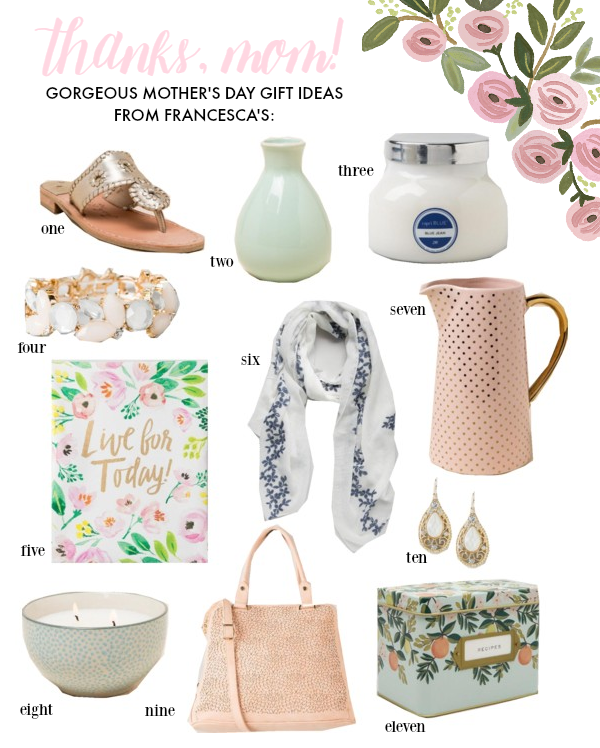 There’s something for every mom to love at francesca’s! It’s one of my favorite spots to find unique & affordable gifts. 1. Jack Rogers Metallic Whipstich Sandal - Totally timeless sandals for any age | 2. Caroline Colored Vase - This comes in a ton of gorgeous hues | 3. Capri Blue Candle - These smell amazing, I give them as gifts all the time | 4. Jeweled Stretch Bracelet - This bit of bling dresses up any outfit | 5. “Live for Today” Canvas - Gorgeous canvas wall art with a postitive sentiment | 6. Avery Floral Scarf - I chose this scarf for my accessory- loving mom, and I know she’ll adore it! | 7. Light Pink Beverage Pitcher- A pretty polka dotted pitcher for the perfect hostess | 8. Sea Salt & Sage Boheme Candle - Reminiscent of the ocean for the mom that who loves beach days | 9. Laser Cut Satchel - The sophisticated version of a carry-all in trendy laser cut and pastel | 10. Stella Teardrop Earrings - Dainty go-with-everything earrings for any occasion | 11. Citrus Floral Recipe Box - Ask mom to teach you how to cook her favorite recipes so you can pass them down to your family some day. Moms never seem to take time for themselves. So anything that can help them feel beautiful, special, and appreciated is a perfect gift option for Mother’s Day! Thank you mom for all that you do, and & thank you to francesca's for partnering with me on this post! I really love white dresses in the summer too. They just look so great. This one is so beautiful.